A few weeks ago, I found myself in Cambridge (our fair city), Massachusetts for about 36 hours. Despite it being a very quick trip, I had about three hours that were unoccupied when I got there, and since I hadn’t actually been on that side of the Charles River since January of 2012, I decided that getting out to see as many cool historic places as I could was more important than resting. I walked a circuitous path within a two mile radius of Harvard Square, seeing many amazing places from my shortlist (like Historic New England’s ca. 1682 Cooper-Frost House) and even more places that happened to cross my path in between my intended points. Near the top of my list was the Old Burying Ground, adjacent to the ca. 1760 Christ Church and 1833 First Church Unitarian / Universalist Church (original meeting house constructed from 1633-1636). I don’t think I’ve ever seen this many seventeenth-century gravestones in the same cemetery before, even in Boston and Salem. (Editor’s note: I’m sure that it’s quite possible that I have actually been in cemeteries that have more seventeenth-century burials as this one, but I certainly didn’t see them if that is the case.) I fully expected to see a lot of eighteenth-century ‘stones, but I guess I just assumed that there wouldn’t be many (if any) from before the church was founded. I’ve been fascinated with old cemeteries for some time now, and became even more fascinated with them during graduate school in some historical archeology classes that I took as electives. I’ve always thought that customs around death and dying in a culture is a fascinating window to view a culture through, generally, so old cemeteries and gravestones are a natural, physically and space-adjacent manifestation of that. Anyway, in a graduate school course reading I came across a slightly different version of the following graphic, which blew my mind. 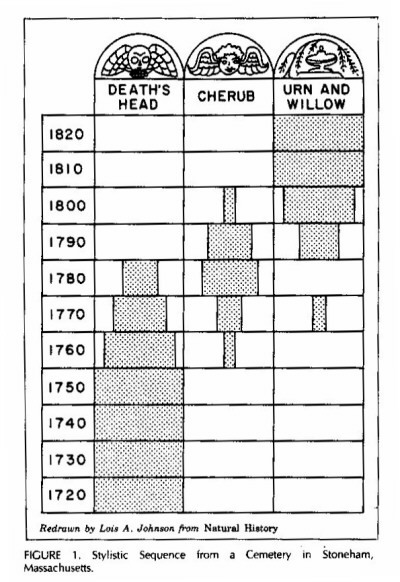 Someone had actually gone out and collected data from this historic, New England cemetery, and then plotted out battleship curves to show how three different primary styles of gravestone ornamentation had waxed and waned in popularity over 100 years. That was (and is) so cool! “Death’s Head, Cherub, Urn and Willow” By James Deetz and Edwin S. Dethlefsen. Originally published in Natural History Vol. 76(3) 1967, pp. 29-37. Via the Plymouth Colony Archive Project (http://www.histarch.illinois.edu/plymouth/deathsheadfg1.html). Since then I’ve made it my business (or, perhaps more literally, my recreational pleasure) to photograph as many older gravestones as I can find, wherever I go. The death’s head motif, in particular, has always completely entranced me. However, rarely do I get to do a more complete inventory of any given cemetery, as most of my travel tends to be work-related, so I don’t have an incredible amount of time to spend on my recreational gravestone obsession. But on my recent trip to Cambridge, I found myself with nowhere to be for several hours, and this incredible old cemetery surrounding me, so I went a little deeper in my documentation. Please do note, I still didn’t even come close to recording every gravestone in the cemetery, but I did photograph about forty unique ones (and oh man, my quads were really thrilled about it, as for each of those gravestones I had to squat down low to get a clean shot, and then several detail shots for most of them). Of the gravestones that I documented, the oldest was from 1676—belonging to a John Poulter, who died at 41—and the most recent was from 1846—belonging to an Eliza Brackett, who died at 32. In memory of ELIZA wife of the late JOHN BRACKETT, who died February 23, 1846, aged 32 years. As you can see from the images, these gravestones are noticably different. One is much more stark, with no decoration other than the inscription, while the other has heavy, almost chunky, symmetrical ornamentation on the sides and top. The inscription, also, is noticeably more typographical and refined in the later gravestone: Mixed cases! Thick ascenders with thin bars! Ball terminals! 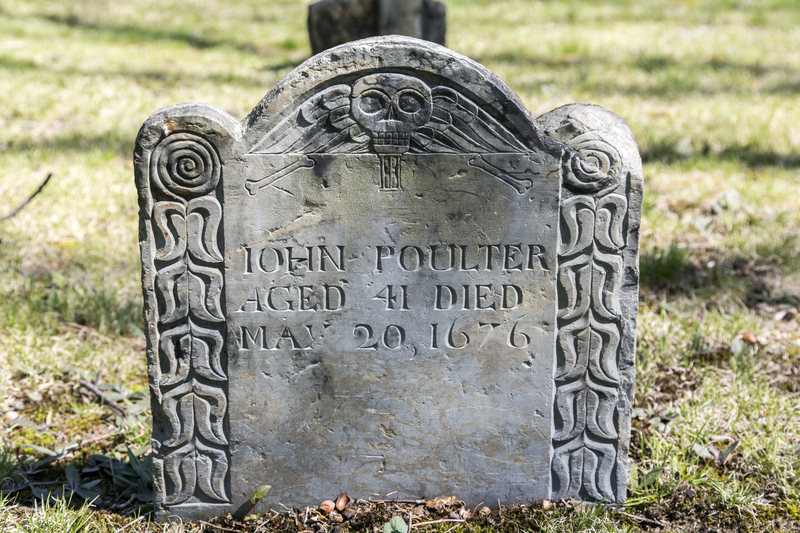 But, lovely typography aside, my true passion is for the older, more ornate gravestones, like Mr. Poulter’s up there. Eagle-eyed readers may have already caught this, but the main decorative element of that gravestone is called a “death’s head.” If you know me at all, you’ve probably heard me talk about death’s heads forever, but for anyone who hasn’t had that misfortune, they were a very common decorative element on early American gravestones. It’s a grim image, with a old, spooky vibe to us in the 21st century. But to the people who lived in Cambridge and other parts of New England in the 17th and 18th centuries, these death’s heads were much more than that. They were, of course, reminders of death. They showed viewers the very face of death. But they also were a small beacon of hope. Carving the intricate designs in these stones would have been no small feat, and with all of the hard work that went into just eking out a living—growing food, keeping your shelter in good repair, hunting, sharpening and repairing your tools, tending livestock, mending and making clothing and shoes, etc.—carving anything more than a name and date into these pieces of stone was done for a reason. It was hard work, but it was done anyway. It mattered to these people. So what’s hopeful about a toothy skull with wings sticking out of it like a terrifying rendition of a golden snitch, you may ask? My inner art historian’s reading is that the death’s head is a two sides of the same coin: the grim reality of death, symbolized by the skull; the hopefulness of a rewarding afterlife, symbolized by the wings. While there’s really no way to prove this interpretation, others have speculated similarly, so I feel pretty good about it. Another, non-mutually-exclusive interpretation, is that the wings are a representation of life, specifically the fleeting nature of it. In fact, in many gravestones, this interpretation is emphasized by additional text or symbology. For example, in Mr. Poulter’s gravestone, if you look closely below the tympanum (that’s the large rounded center part on top of the main rectangular body; the two smaller rounded parts on the sides are called “shoulders”), right under the death’s head’s chin, you can see an hourglass. Again this is paired with a more visceral reminder of our mortality—some long-bones. The secondary iconography: Bones and an hourglass. The subtext of this time-related iconography is also frequently brought into text with the Latin inscription, “Fugit Hora” (“time flies” or literally, “the hour flies“). The engraving is a little worn away on this gravestone (Thomas Foster, d. 1679) but if you look closely, directly below the wings of the death’s head, you can see FUGIT HORA written, one word on either side of the hourglass, with some crossed long-bones, and a coffin, for good measure. Another common Latin inscription, often paired with Fugit Hora, and perhaps more well known, is “Memento Mori,” or “remember death.” Those two phrases, and their presence together on many headstones from this period, hammer home the juxtaposition between life and death that these early colonists were depicting through their iconography. Death was very real, and very present in their lives. They couldn’t hide from death, and they didn’t try to. They almost certainly feared death, just as we do today, but it was just so much more common in their lives that their relationship to it was fundamentally different. As such, in their funerary practices they wanted to look death almost-literally right in the face, in order to celebrate and be thankful for what time they were given. And I find that fascinating. In that spirit, I spent some time shooting as many older-looking gravestones as I could with the limited free-time I had in Cambridge, and created a gallery and small spreadsheet with the names, dates, and photo IDs for each one for your perusal. My dream would be to take a day or so and actually do them all, to complete the records for this cemetery at Find A Grave (which is a great website for finding a specific grave, or browsing through known burials in lots of cemeteries). Anyway, feel free to browse through, and look for the progression from death’s heads to cherubs, and take some time to admire the intricate floral motifs and other symbolism on some of these guys. I hope it’s interesting, helpful, or both! 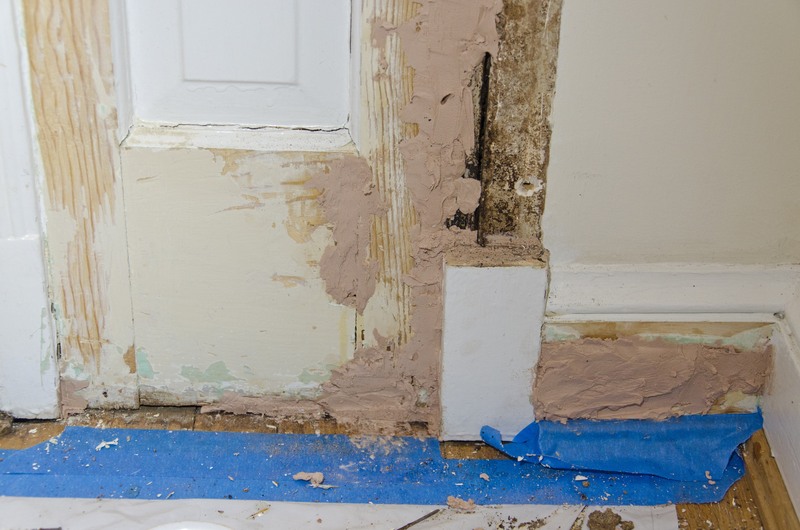 Several months ago, I purchased a home in Maryland, mostly sight-unseen (I’d been there, but hadn’t really walked around and taken a close look, and there was no home inspection). After moving in, I immediately discovered some issues with the building envelope. 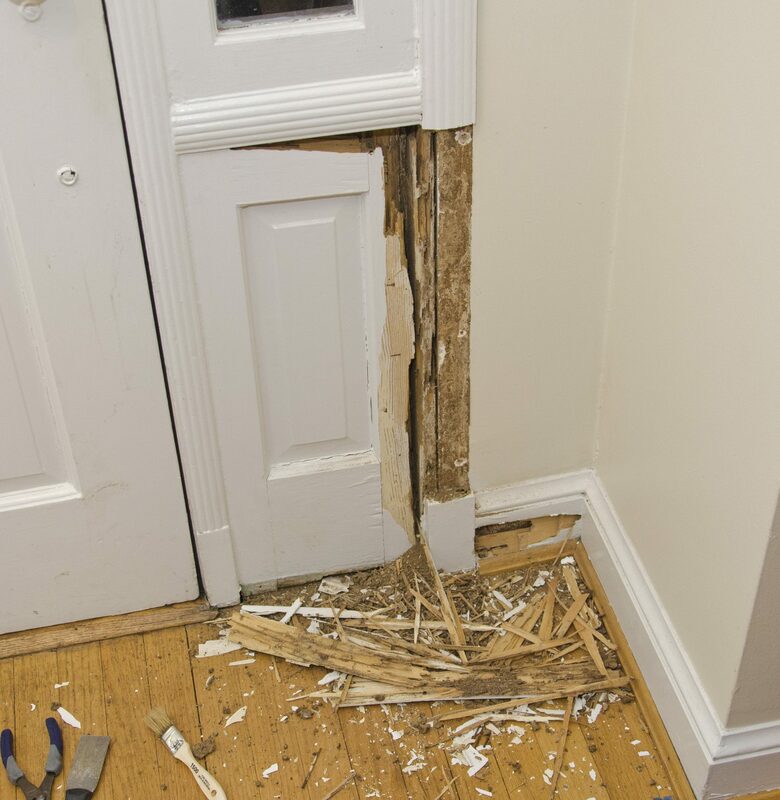 While some minor termite damage in the bottom right corner (from the perspective of someone inside the home) of the front door surround had been disclosed (the termites had been treated, but the wood was left in a damaged state), it was hard to ascertain the full extent. 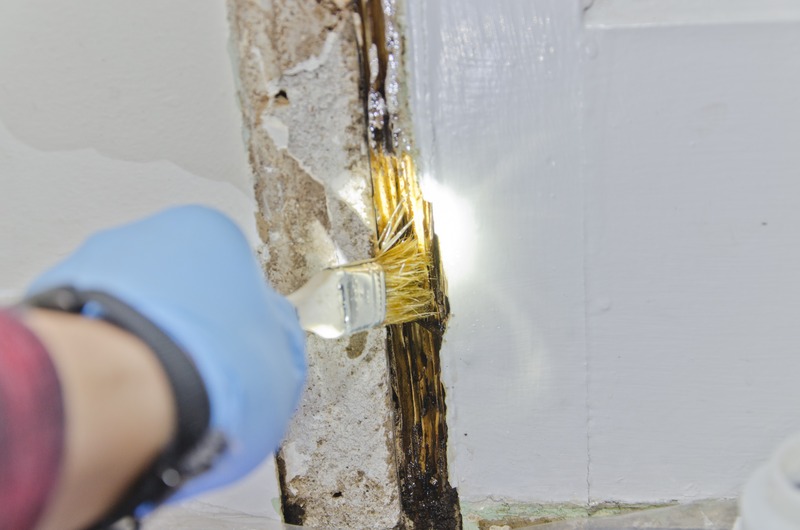 It was obvious that there had been subsequent water infiltration that had caused a small area of paint to bubble, but it didn’t sound like it had been an ongoing issue, or that it would be more than a small pinhole to patch and repaint. Through sounding near the area of visible paint failure, it became apparent that the damage was more extensive than the prior owners had thought. Additionally, thanks to the errant removal of a snow boot in the winter that hit a piece of trim harder than expected, it was discovered that there was additional damage on the left side of the door surround as well. The moulding, which has what I can only describe as a scalloped profile, was completely hollow behind the paint in many places as was the plinth block immediately below it. 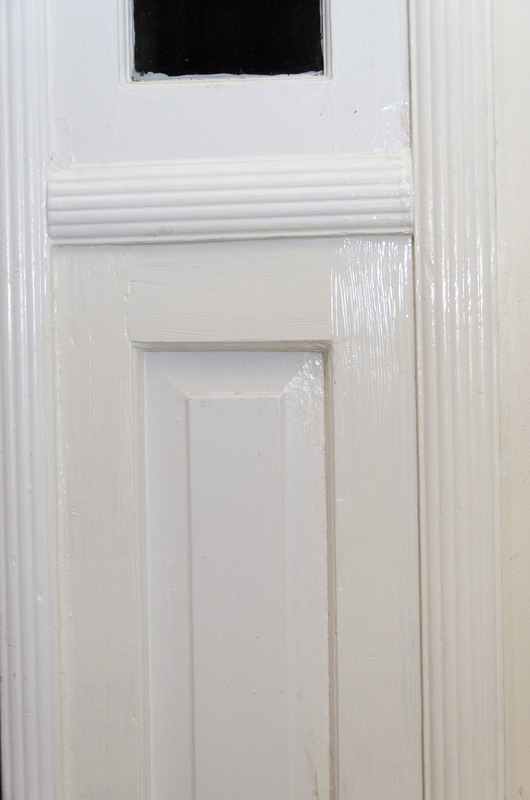 Moudling profile of the “reeded” trim that is found throughout the finished areas of the house. 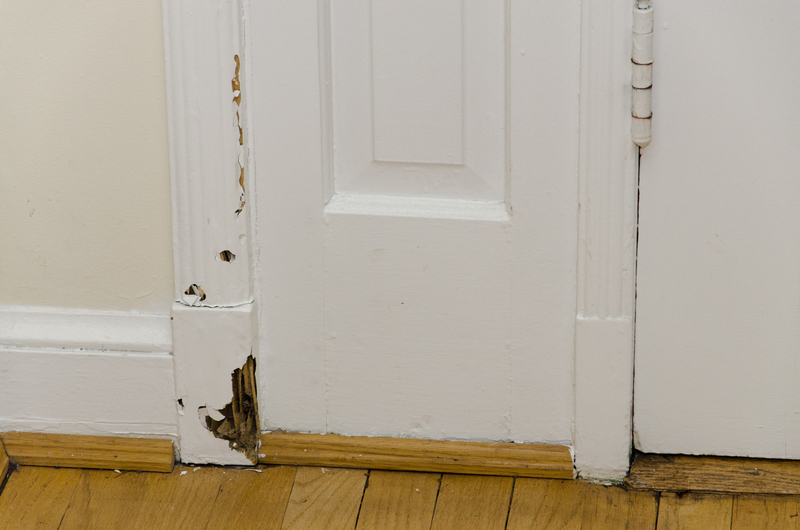 The visible extent of the wood damage on the left side of the door surround before beginning conservation project, including a mostly-hollow plinth block. 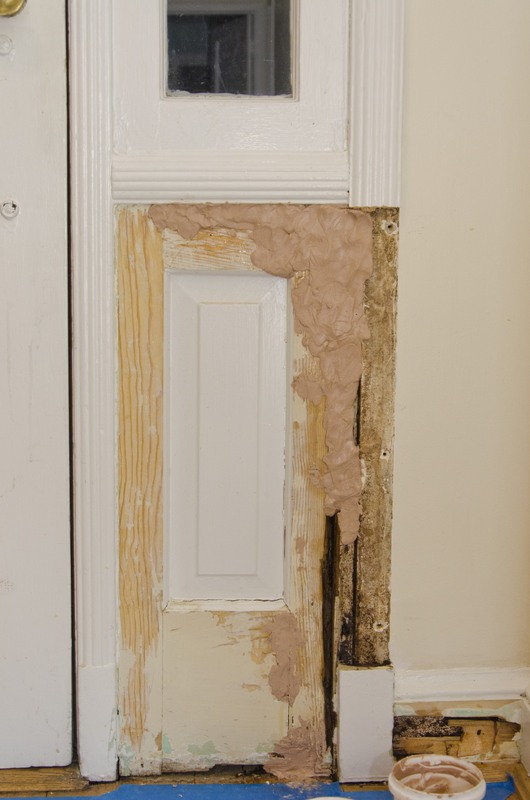 The visible extent of the damage on the right side of the door surround before beginning conservation project. Slightly overwhelmed that the extent of the damage was greater than was initially apparent, and concerned about the continued potential for water infiltration (not to mention the potential energy loss) through the building envelope only destroying more sound material, I knew that something had to be done, sooner than later. Inspired both by the opportunity to apply my conservation knowledge to a new area of practice (while I have been educated about wood conservation, I had not had the opportunity to perform any prior to this project) and by a lack of funding available to hire someone else to do the work, I began to plan the restoration project myself. I researched materials (and called in some help from folks at the National Park Service and the Fairmount Park Historic Preservation Trust for their sage opinions on epoxy products), created a budget, and found a weekend where I would be home alone and free to make an enormous mess. In the end, I decided that this largely looked like a job that could be handled by consolidating as much existing historic material as possible, and replacing what could not be conserved in-kind. Fortunately for me, I was able to procure historic in-kind replacement moulding from my basement, which is unfinished, but had matching trim installed around the stairwell opening. The first step in the project was to remove the spare trim from the basement. 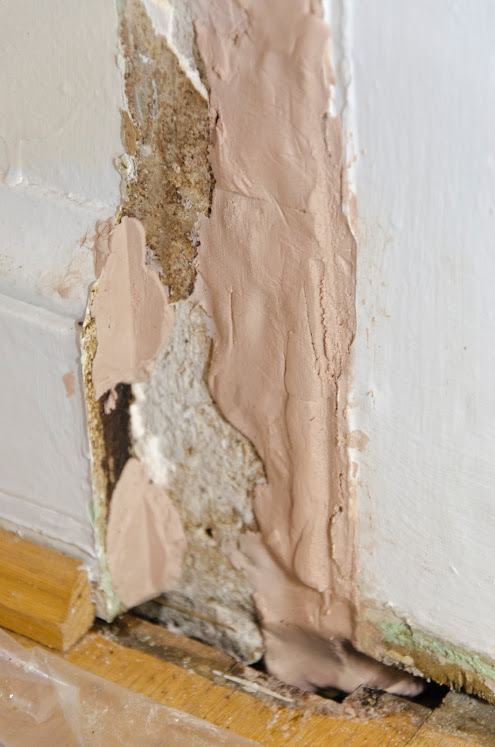 I cut along the edge of the moulding with a razor to break the paint bond and then used a rigid metal putty knife to begin to create a thin gap between the trim and the wall beneath. 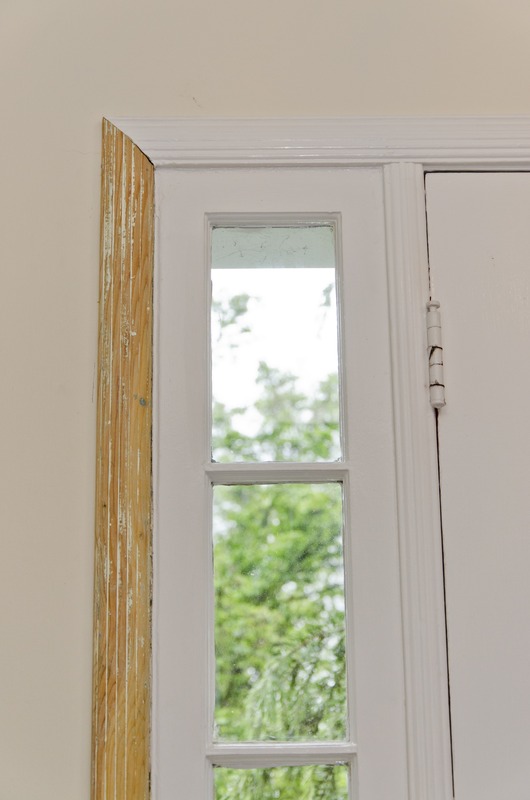 Once there was a large enough gap, I followed this up with a small pry bar, and within a few minutes the trim was removed, revealing a few different paint colors that had been hidden from view on one of the two pieces of trim. This gave me the thinnest excuse I needed to attempt to remove the paint down to the wood with a stripping agent (Back to Nature’s Multi-Strip product). One piece of spare trim, with Multi-Strip applied. With the trim down, I left the stripper to do its work and began to open up the door surround, starting on the left side. First, I used a small screwdriver and the prybar to probe the plinth block to see if I could determine the extent of the damage, hopeful that enough healthy wood remained to consolidate and repair it. 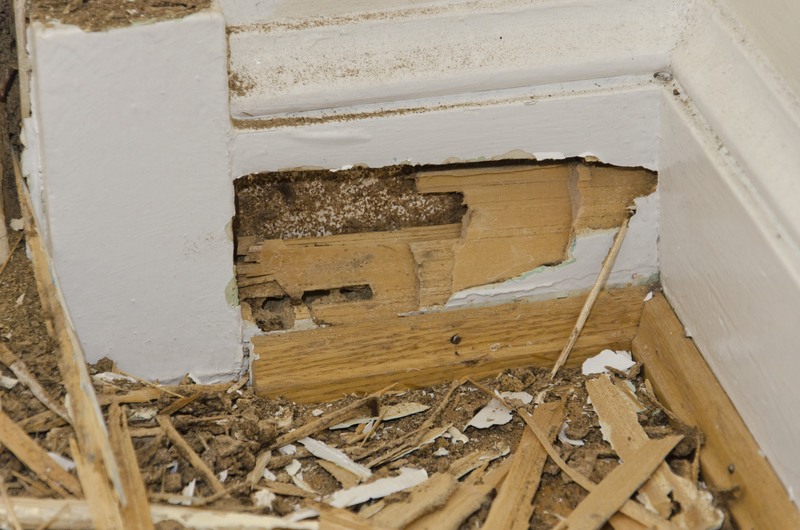 Unfortunately it almost immediately became clear that this was not the case as more and more “dirt” (the remains of termite-digested wood) came pouring out of the opening. Within a few minutes, the plinth had become a pile of dirt and paint chips on the floor. 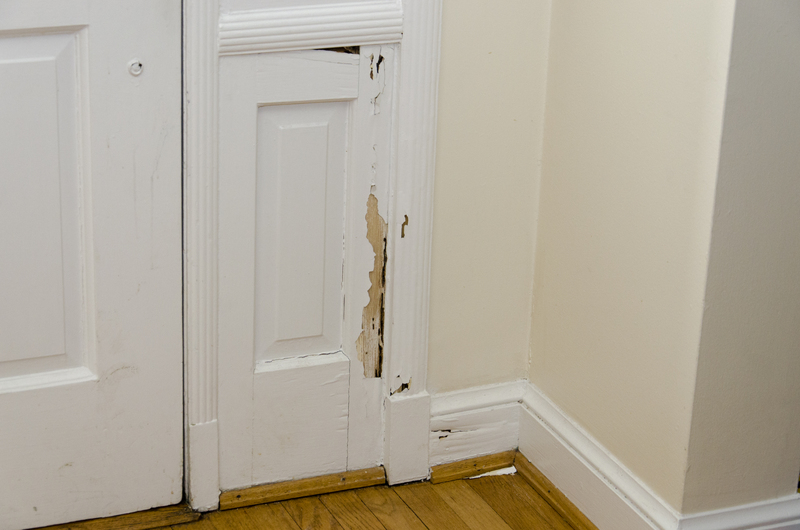 Disappointed, I continued removing damaged material by cutting and prying away the trim. Once I had removed the moulding up to the top of the adjacent decorative panel, I could see that the termite grooves on the back continued past my cut. The damage was far worse near the bottom where the moudling met the plinth, but I decided it was better to remove the existing trim up to the mitre as a historic, in-kind replacement was readily available. Once this piece of trim was removed, I took it aside to be conserved and stored for later potential use if a shorter piece of this trim is ever needed. Farewell, original plinth block. I hardly knew ye (but the termites surely did). The back of the moulding that was removed, showing termite tunnels and “dirt.” Note also the jagged appearance—this was what remained of the bottom of the moulding, which should have been squared to meet the plinth block, but there was nothing but paint remaining at most of the bottom, and when the paint bond was broken, that paint crumbled away. A wide-shot of the left side of the door surround, post-excavation. After cleaning up the resulting mess from the left side excavation stage, it was epoxy-time—the main event. 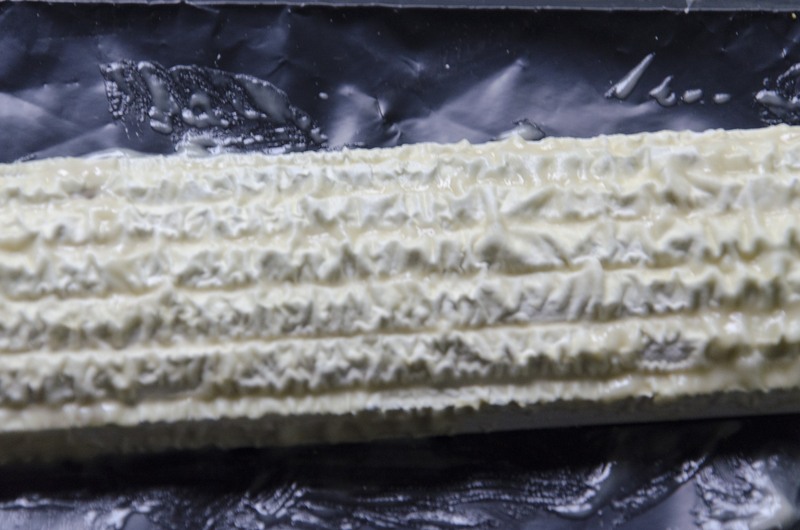 I had read the manufacturer directions, watched their videos, and learned all about epoxies as a material conservation method in grad school, but was that going to be enough? I put a small piece of plastic down on the floor where I would be working, threw on (or rather, desperately tried to cram my hands into) some disposable nitrile gloves and a pair of safety glasses (I know it should have been goggles, but I was far too sweaty for that to have ever worked without them instantly fogging up) and got down to business mixing the two-part epoxy resin to consolidate, seal, and prime what was left of the termite-damaged wood. I used System Three’s RotFix for this, and it was fairly straightforward. First I used the nozzle on the cap to pour the resin into every crevice I could, and then I used a small, inexpensive brush to apply it directly to every exposed damaged wood surface. 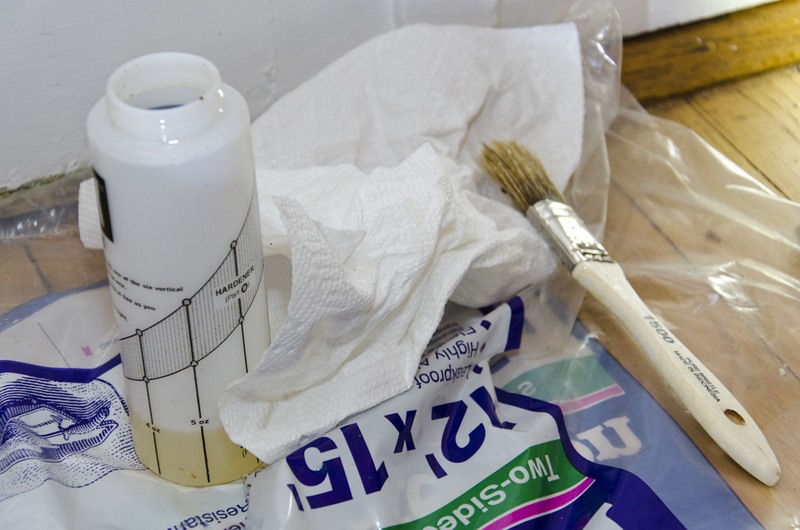 The RotFix epoxy mixed in the convenient measuring bottle, ready to be brushed and poured into the damaged wood. Brushing the epoxy resin to ensure that every remaining wood fiber gets coated. Next, I readied the two-part epoxy putty to fill in the voids. For this I used System Three’s SculpWood product, which was remarkably easy to work with (at least in the mixing and application phase). Equal parts of the epoxy and hardener kneaded together into a tan putty that I then packed in as deeply as possible to make sure that every void was filled. The directions that I reviewed were unclear about this, with the video on System Three’s website indicating that one should wait for the RotFix to fully cure before applying SculpWood, while various other written directions from the manufacturer indicated a better bond would result if the SculpWood was applied while the consolidant was still wet. I decided to follow the latter as it seemed to make more sense. If the resin was just a more diluted version of the same epoxy found in the putty, then applying the putty onto wood that is wet with the uncured resin would mean that both products would have the chemical reactions that lead to their curing happening simultaneously, creating a stronger bond than having those reactions take place separately, thereby creating two adjacent but distinct hard surfaces. 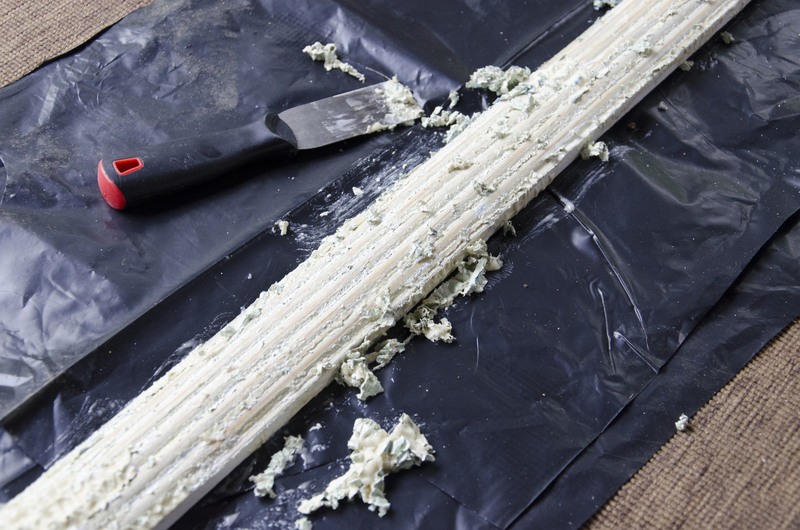 When I was done packing the putty in, I used my gloved hands and a putty knife to roughly shape it to just a fraction of an inch above being flush with the surface of the wood. Then, I left the epoxy to cure for 4-8 hours. System Three’s SculpWood epoxy putty, prior to mixing and application. 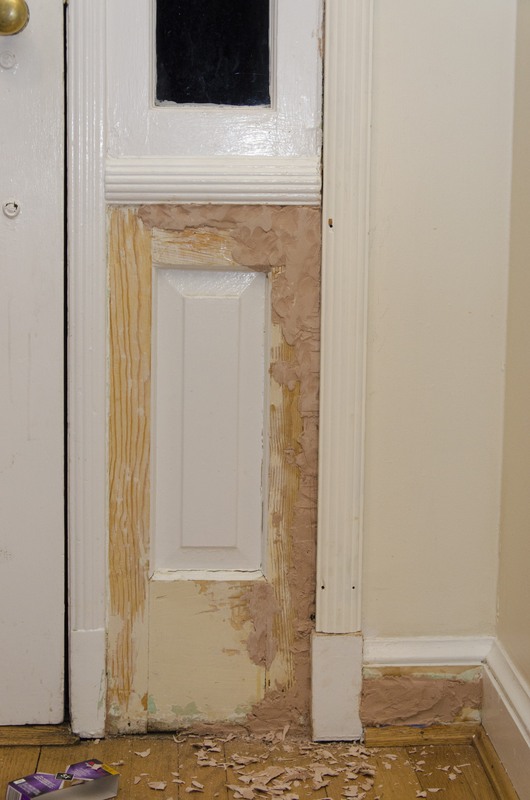 A detail of some of the heaviest areas of epoxy repair on the left side of the door surround, which the replacement trim and plinth block will be applied to once cured, filled with the epoxy putty. 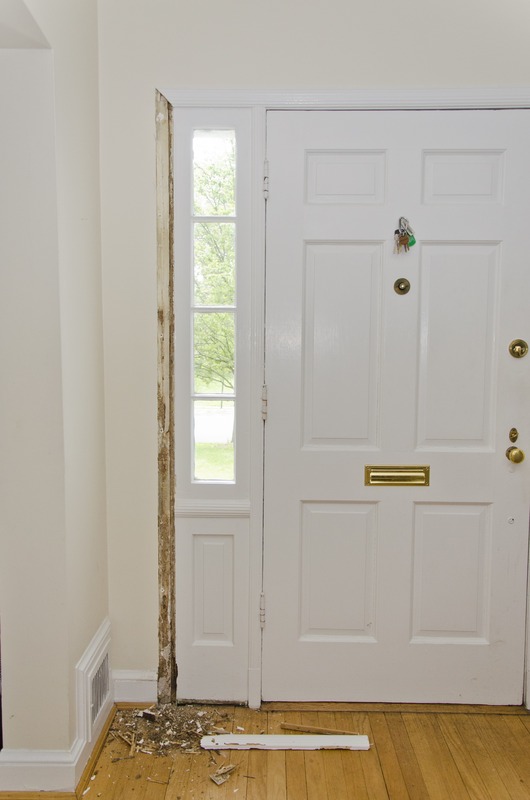 Unable to do any further conservation work on the left side of the door surround until the epoxy cured, I went to remove the stripping agent (and several layers of paint) from the replacement trim that had been retrieved from the unfinished basement. The stripping agent had coagulated on the surface nicely, and I was pleasantly surprised that despite not waiting nearly as long as the product instructs, the paint came off fairly easily in a few steps. Don’t get me wrong, it was messy, and a lot of work, but I would have never gotten as much paint off as I did in the short period of time that I spent on it if I had used nothing but sandpaper and elbow grease. The stripping agent, ripened (and slightly out of focus). After a quick scrape with a putty knife most of the paint was gone, with some pigment left to be washed off with water and a rag. It may be unclear from the photograph, but it became very clear at the time that this was much much worse than I had thought, and that not only was a great deal of the moulding and baseboard missing on the right side, but also a significant portion of the top rail and right lock style of the panel. In a project with a larger budget, replacing the panel in-kind might have been preferable at this point, but it seemed like a very expensive proposition to have a panel custom built by a carpenter just for this project, so it became an absolute last resort in my mind. 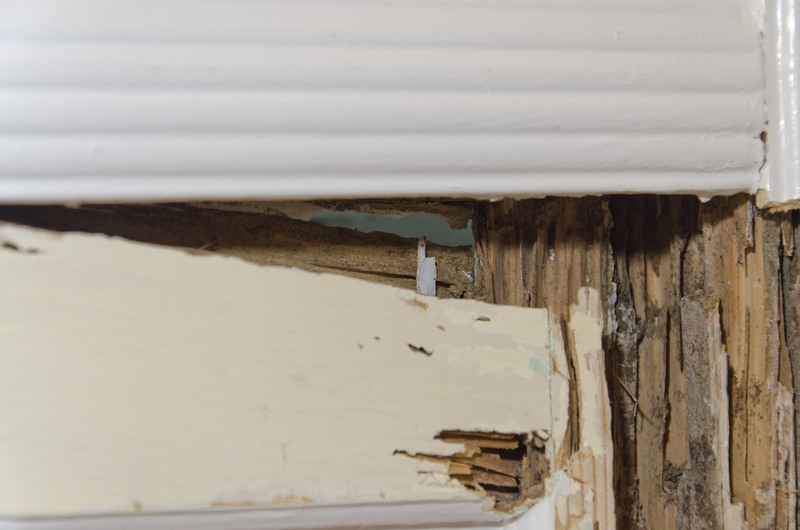 If this repair could be done via consolidating and rebuilding the damaged wood with epoxies, then it would be, no matter how much it strained credulity. Just to be clear, that area of pale green-blue near the center of the photograph is the night sky visible from inside the house, through what was formerly the top rail of the decorative panel. But for a nice thick layer of glossy paint, the front of the house would have been open since well before I moved in. 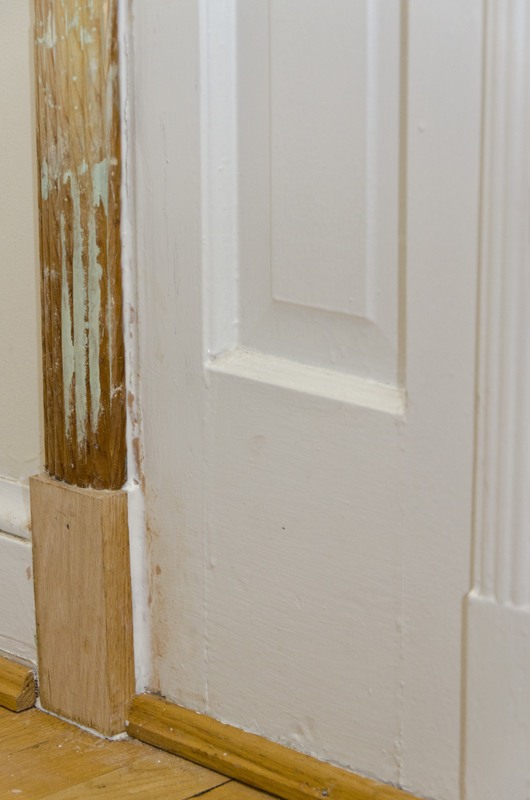 The baseboard trim was also 80-90% gone, but the nice ogee decoration at the top had its shape preserved by numerous layers of paint. I used some painter’s tape in an attempt to create a barrier over the hole through the top rail of the panel on the outside of the house, so that I could apply the epoxy resin and putty without it all being pushed / leaking out from that side. Shockingly, this worked. Following the same mixing and application steps as before, I then used all of the epoxy putty that I had left in an attempt to rebuild the panel. And boy did I pack a lot of putty in there. Unfortunately, I ran out with a large area of the panel, the baseboard, and the board that anchors the trim to the plaster totally unfilled, and it was nearly 1am, so getting more putty to continue with was off the table. I’d have to wait until the morning to try to finish. Lesson learned: Find a place with a good return policy and always buy more epoxy than you think you’ll need, because it really stinks to run out if it mid-project. The paint store that I found that carried SculpWood didn’t open until 10am, and was across town, so I decided to use the hours of the early morning to install the in-kind replacement trim and plinth block on the left side of the door surround. Fortunately, I had found a nice piece of oak that was perfect for replacing the plinth block (if a little high-end). It had been left behind as scrap at the nearby big box home improvement store and I found it when I went there to get some finish nails and they let me have it for free (budget!). I took it home, cut it to size, and then took the replacement trim and made the 45° mitre cut necessary to install it and nailed both pieces snugly in place. I also had the opportunity to check and see how the curing had gone on the epoxy, and was delighted to find that it was hard as a rock (or, perhaps more apropos, hard as a nice piece of undamaged, rot-free wood). Looking good, in-kind replacement plinth block! Looking good, historic in-kind replacement trim and miter joint! Then it was time. 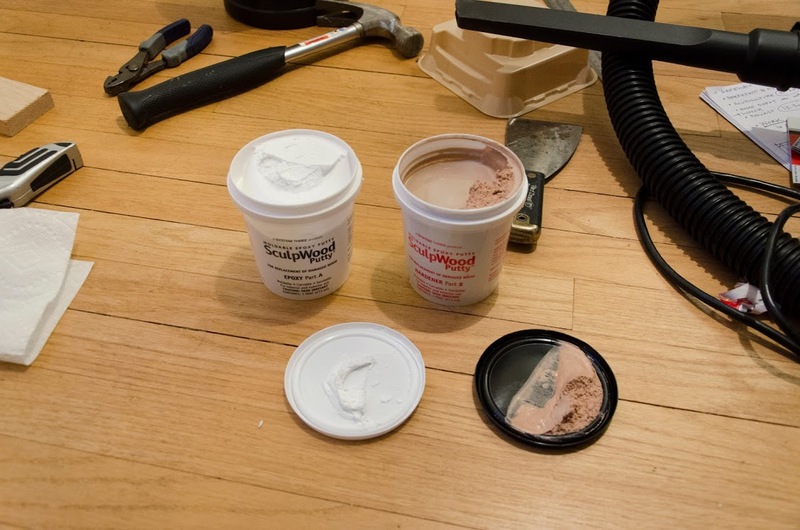 I rushed across town to the excellent Monarch Paint in Chevy Chase, D.C., grabbed another quart of putty, and rushed back to complete the job, stuffing more putty into the remaining voids of the panel and baseboard (which was almost another half-quart). More (epoxy) putty, less problems (hopefully). Eight hours later, I was finally able to start to scrape and sand down the enormous amount of epoxy down to be flush with the wood, install the replacement trim, and cover it all up with a coat of primer, followed up by a second coat the following day. Scraping and sanding the cured epoxy to shape. Less fun than mixing and applying the epoxy, perhaps. This is nowhere near complete. A detail view of the panel, after priming (the primer is still wet in this photo). The (almost-)completed door surround. All it needs now is a little semigloss to match the existing finish on the rest of the surround! 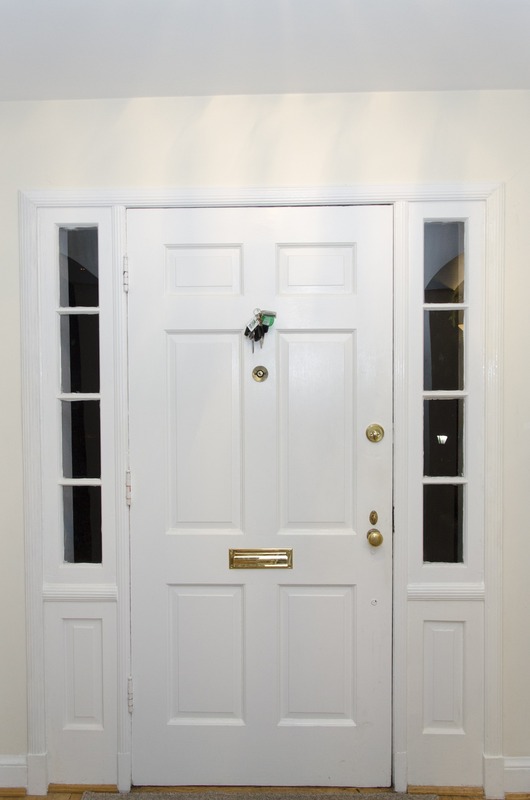 Miraculously, in the right light, even without a finish coat of semi-gloss white paint, everything looks, feels, and sounds like a door surround that was never damaged. For an increasingly improbable project, it feels incredibly good that it all came together and I was able to preserve the architectural details of the main entryway of this historic house, and fix a compromised building envelope, without breaking the bank or losing my hair. Thanks for reading! A summary GIF: The areas in red indicate areas of near-total loss of original historic material; yellow indicates areas of material that were damaged, but less severely; green indicates areas of in-kind replacement (the darker green = historic replacement material, the lighter green = modern replacement material); purple indicates areas of lost historic material that were almost entirely reconstructed with epoxy. Click for the full-resolution image. 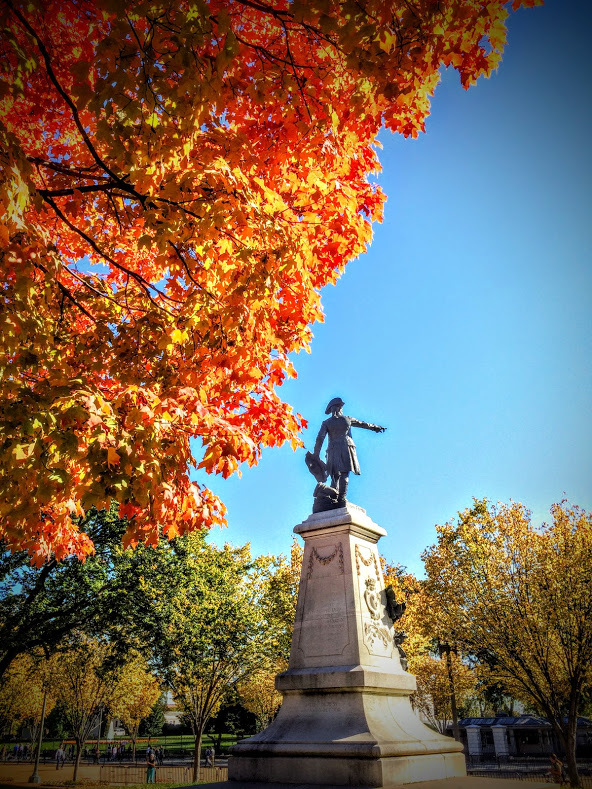 One of the park’s four resplendent maple trees and Marshal Jean-Baptiste Donatien de Vimeur, comte de Rochambeau, enjoying a beautiful fall day in D.C.